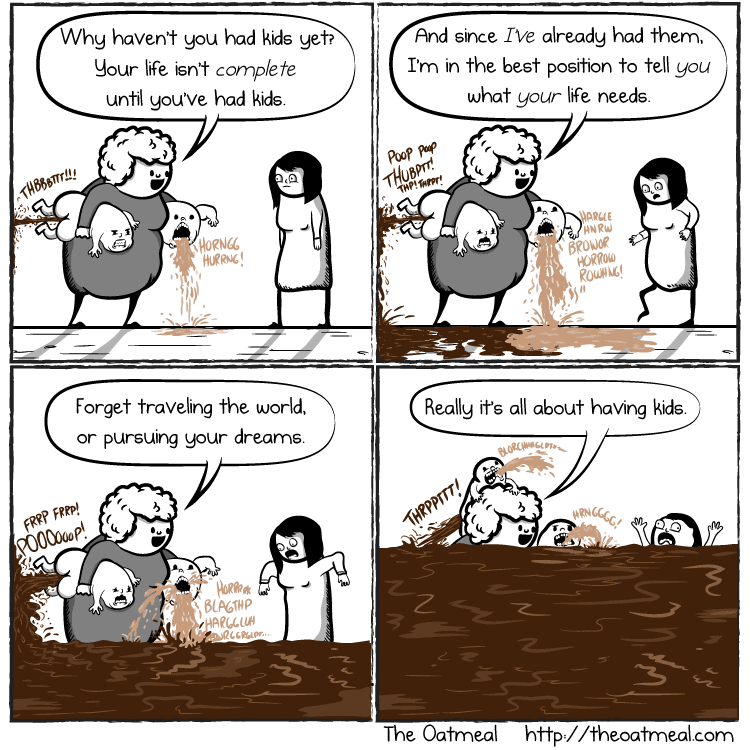 I find it interesting that some parents seem personally offended by the childfree lifestyle. Yes, we know your kid is the best-thing-that-ever-happened-to-you-in-your-life, your pride and joy, your reason for living. And we’re happy for you. Truly, we are. But it’s not for us. We don’t want to be argued with or convinced otherwise. Parenting is one experience, one journey. We are taking a different path. The two things that linger in the back of my mind about our decision are the fact that my parents will never get a chance to be grandparents (my Dad is particularly bummed about this), and the possibility of dying old and alone. When it comes down to it though, is having kids just so you might have someone to take care of you when you’re old really a good reason to have them? Not really. All of our friends who have kids wanted to be parents, and are happy with their lifestyles. Parenting isn’t something you can casually dabble in. You have to be fully committed. I recently read a great book of essays by women on not having kids, No Kidding: Women Writers on Bypassing Parenthood. It was great to read the experiences of other women who have made the same decision who are happy with their choices. I would recommend checking it out if you’re struggling with other people’s views about your decision to be childfree or just want something to relate to. If you are a couple who both work and have no kids, you are “Dual Income No Kids,” or a DINK. This is a great website for couples looking to plan financially without having to worry about buying diapers or sending someone to college. Kaye Walters is the author of a book of the same title as her site, and has a site with lots of resources for the childfree community. This is a great blog centered around being childfree, created by Amy (a sociology professor who studies childfree families) and Lance, her husband. 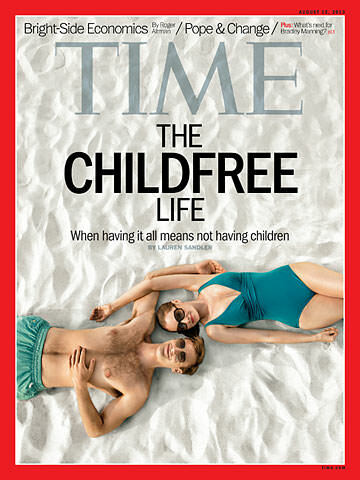 They offer a lot of great articles and posts about childfree people and lifestyles. The Not Mom is a site specifically for women who are childfree with some very interesting articles. I just stumbled upon your site as I was trying to remember the name of the Ananas Bar in Reykjavik. So wonderful to see another childfree couple enjoying their lives! After trying–with great difficulty–to have a child, we finally drew a line in the sand two years ago and called it quits. Instead of sulking about the life we could not have, we have since happily embraced childfree living, and all the freedoms it affords. It is indeed odd running into those who seem offended by our lifestyle (especially if they know our background and personal struggles), but if there’s one thing I’ve learned in this life, it’s that I’ll never make everyone happy, and it’s quite pointless to try. Better for us to just focus on the life we have together and enjoying that, than on what others may or may not think about our life choices. Thanks for the list of recommended books and resources, and for sharing your adventures with the rest of us. Bon voyage! Well said, Diana. Thanks for visiting our blog! Best wishes for many more great adventures in the future. Great Blog! My (new) husband and I are excited to start our child-free travelling life together. Is the https://childfreelifeadventures.com/ website gone? Bummer, I was excited about that. Hi, I’ve got one to add to the website list! There’s a brand new social resource for happily child-free women living in the UK, called Childfree Women UK & Ireland http://www.childfreewomen.co.uk/become-a-member – a free social network where CF women living in the UK/Ireland can talk, meet, and make friends with like-minded ladies in their communities. Just thought it was worth telling you about it!